Wrapped Up in Your Own Social Media Web? Did you know a spider’s web isn’t just one mass of sticky silk? The threads that join at the center of the web aren’t sticky at all! Spiders strategically use this thread to navigate in and out of their webs without getting caught like their prey. 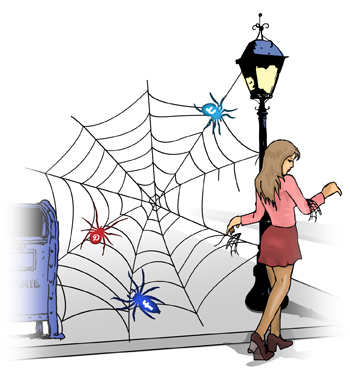 Similar to a spider’s web, experts can get trapped in their own social media web because it’s either a time-consuming obsession or they don’t have a strategy and get wrapped up in the details. Experts who know the safe thread from the sticky thread are the experts who flourish in their social media efforts. Here are 5 strategies you can use to safely and successfully navigate in and out of your social media web presence. Don’t spread yourself too thin by attempting to have a presence on every social networking site available. Concentrate on those with the most popularity for your target audience, i.e. it’s fairly safe to stick to major social networks like Twitter, Facebook, and Pinterest. Keep an eye out for where your audience goes to avoid being the sole guardian of a dead space no one visits anymore. People want to be in the loop that’s relevant to them. They want to know what’s going on, what’s available, be included in the conversation, relate to other people, know what’s happening, and more. Become a beacon of positivity and share the things you like and even love. Audiences tend to lean toward the relevant and positive, rather than the negative and irrelevant. Ever logged into your own social networking accounts, saw your wall flooded with irrelevant posts by others, and had that feeling of “not you again!” Always place quality over quantity. Find that balance you need to prevent yourself from being ignored, unliked, unfollowed, etc. Find the sweet spot between too much and too little. Consistently post a variety of items on a variety of topics (e.g. 1 photo, 1 text-based post, 1 link, etc.) to keep it fresh and avoid inundating your audience with 1 type of post that’s easily ignored. You can have heaps of followers and still have no success in your efforts. This is a result of focus on numbers and not on quality involvement. The amount of people following you is less important than how you actually interact with them. An engaged audience is an active audience that will help spread your credibility and message. Focus on your immediate audience (those actually listening) and more followers will brighten your future. There you have it! Locate your audience and show your appreciation for their participation. Reciprocate with positive, relevant content to strategically navigate in and out of your social media web. Want more social media strategies for Expert Authors? Discover how to share your articles on Facebook and Twitter as well as on Pinterest. Especially like the “Focus” point – it’s so easy to get caught up in building a large number of followers, but I’ve learned the hard way that it’s much better to have fewer followers that are truly interested than more who are not invested. Proof that sometimes size DOESN’T matter! Awesome blog post. I really do need to polish my social media marketing skills, and this post is a great start for me. Thanks! The role played by social media cannot be avoided at all. It is one of the key tool for our success. Sorry, just a typical ‘nothing’ post to me. – ‘get involved’ – wow! It’s just a post for the sake of posting and sucking up to Google. A lot of people brag about their numbers but if there’s nothing happening interactively it doesn’t mean a thing. BTW I hadn’t heard anything good about pintrest yet. Sound advice for those new to, or trying to find their way around social media. Thanks for the post. a great blog learnt new thing about social media ,not to make too many account in different socail media site but only make 3 an 4 social media account and follow them . Like the insight given, it is so hard to balance all things “Social Media”. I have come to the realization I need to focus where my demographics I want to reach are, which varies from each marketing campaign designed. A lot of what I am targeting demographically are women, facebook and the upstart Pinterest cover it best from the returns I have seen on my campaigns, thank you for the lesson in objectivity, duly noted and trying to apply in different fashions..
Having spread myself quite thin at times in my social media, I really appreciate what you are saying. Lately, I have placed the greatest emphasis on Pinterest because it is fun, easy, and helps me to connect with so many people based upon our similar interests. And then I realized that I can link to my articles and books and projects and web sites – and – if people have already connected to me without anything being offered or sold to them, they are more likely to become interested in what I am offering. Your advice is right on! I find myself regularly commenting on the EzineArticles.com blogs because you are teaching and informing us in every post. Yesterday I ace across a Feb page where the owners posted a picture of a fathers day cake. It received over 200 comments. It would prob have received less if in a shop window in a busy street. Relevant? Yes. Fun? Yes. engaging? Definitely. The construction of a web presence is troublesome. I wish to be sincere as suggested above but to be sincere and serious creates a difficult profile on the web when there is so much entertaining and distracting noise; and it is particularly difficult if one is not used to blowing one’s own horn. But thanks for the advice. I love pinterest…if you need to redecorate your house, come up with new ideas for 4th of July snacks or superbowl snacks, new ideas for your party, yard, shop for something totally unusual, that is the place to go. Pinterest makes it easy for guys and gals to find a quick and new idea. Great post, i totally agree. I admit to get lost in too much vs quality as well. So it’s a great reminder. And yes, focus, focus! In fact, your advised is good and great. After all, we are told that too much of every is bad. And I think, I t could apply to the social media as well.One involving in too many of them, can not only confuse one, but equally give one less time of paying attention and concentration.However, there is freedom of choose. Regards. Thank you for the great article. We all have spread ourselves too thin at times. Focus is very important and joining and participating in groups is one of the best ways to get your message out there. Pinterest is one of the easiest search to find people with related interests.